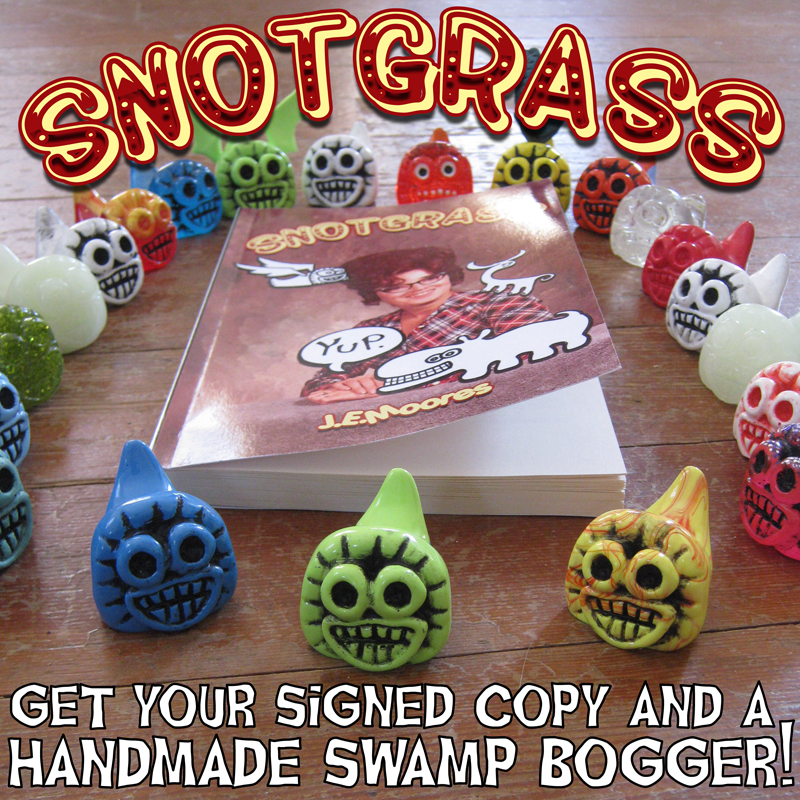 Snotgrass a book by J.E.Moores signed with a handmade Swamp Bogger resin toy. Limited time offer. 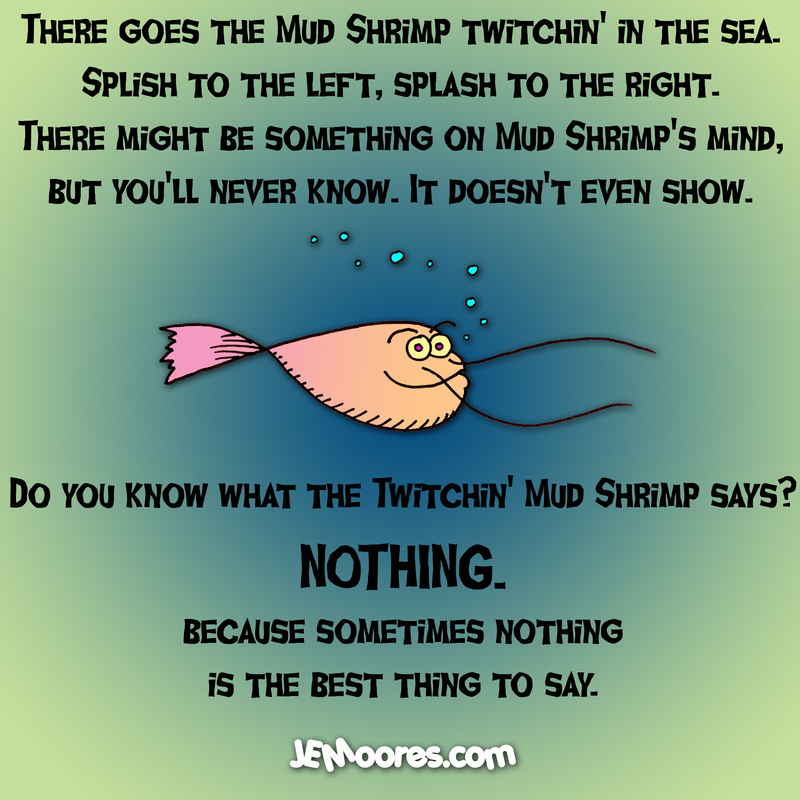 Each Swamp Bogger is unique and shipped at random. Click below for ordering info. When I was about 4 years old a friend of my grandfather had his stock car parked in the barn of our Maine farm. The men would gather around and work on the engine getting it ready for the next big race. Of course I was curious. I wanted to climb up into the driver’s seat and sit behind the wheel. I wanted to bounce up and down and go “Broooooom! Broooooom! Broooooom!” while pretending that I was driving the car. I never made it. Instead, when doing my best to climb into the vehicle, I leaned on a chemical fire extinguisher that was mounted behind the seat. The safety pin was removed so in case of a fire the driver would have the extinguisher handy in an emergency. The fire extinguisher blasted chemicals designed to put out gasoline fires, directly into my face. I fell back onto the wood barn floor clutching my head as the chemicals burned into my eyes. My grandmother was carrying a basin of dishwater out after supper in order to dump it. She saw the whole thing and poured the dingy soap water directly onto my face. I was screaming. The world had become a blur. I couldn’t see. My grandparents rushed me into their car and we headed off on the long trip from the small town of Washington, Maine to the city of Augusta. All the way my grandmother sat in the back seat with my head on her lap. She had water and a washcloth and continued to rinse my eyes during the hour long trip to the hospital. The doctors were unsure how things would turn out. I had burned my corneas and done extensive damage to my eyes. The water my grandmother had applied to my burns was the best luck I had that day. The rest was up to time. I was blind for days seeing nothing but blurry movement and contrasting shapes. Light hurt my eyes so they left me to rest in my room with curtains drawn. Over time I regained my eyesight and needed to be fitted for glasses. Without UV protection from the sun, my lack of corneas made it difficult for me to deal with bright sunlight. I would get headaches and migraines during the daylight hours for the rest of my life. Aspirin was my breakfast of choice each day. I discovered Excedrin and then BC Powder as my daily drug of choice. Here I am forty-six years later and light still kills my eyes. I am nocturnal, a creature of the night. This is my story. 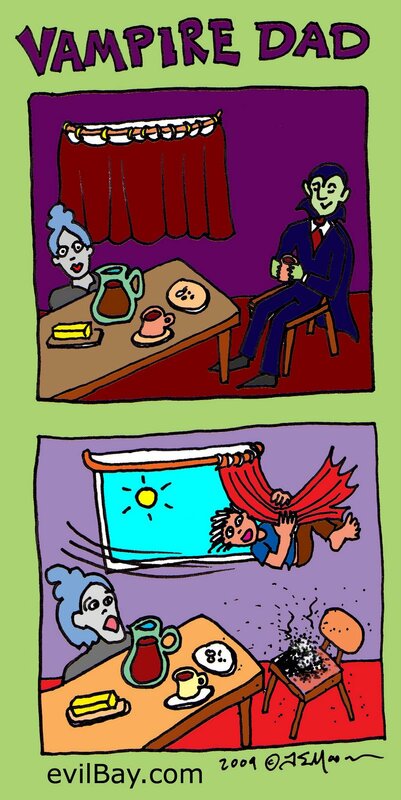 This is how I became Vampire Dad. This is one of the oldest photos in the family album. 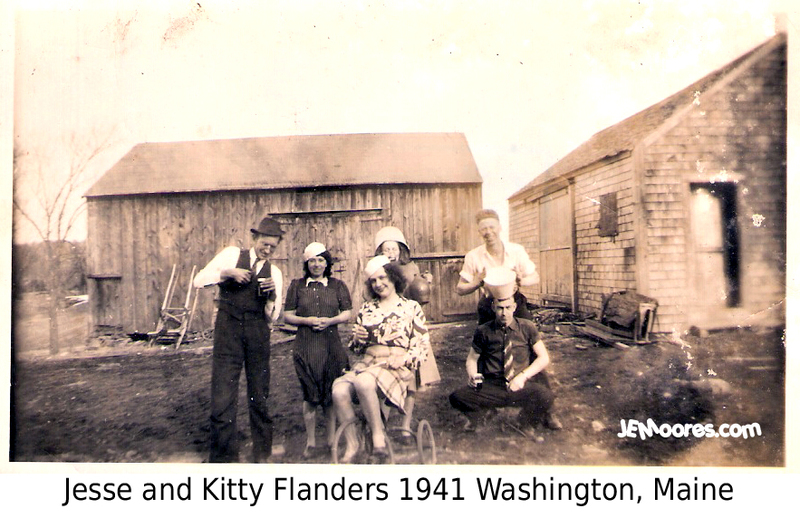 It’s a photo of my great grandparents Jesse and Kitty Flanders at their old farm in Washington, Maine. They’re the ones standing in the very left side of this photo. That’s my grandfather crouched down wearing the tie. I’m not sure, but that might be my grandmother, the one who is hard to see holding the little brown jug behind the young lady on the tricycle. I come from a long line of very silly people. I mean, just look at ’em. They all have buckets on their head. Who knows what they are drinking, but I’m sure it ain’t milk. I never knew Grammy Flanders to drink, so she’s the only one there without a mason jar full of what I assume is beer. I think it’s beer because it looks dark with a frothy head. Let’s look a bit further at this photo. Off to the left the tree has no leaves. Way back in the field, there are some traces of snow. This is late March, early April, 1941. The lawn is still muddy from snow melt and the grass is not yet standing. I bet it’s a Sunday after church. That’s why they are dressed in their Sunday best. This isn’t just a celebration after a long Maine winter. They may not know it, but this is the last hurrah a few months before the Japanese attack on Pearl Harbor and the US gets involved in WWII. My grandfather would later join the Army and be wounded in 1943 during the Battle of the Bulge. So let them have their fun, because there are troubled times ahead for these people. Hitler frightened the whole world, and things would never be the same after that. My grandfather would spend all of 1945 in the hospital after having a metal plate replace the missing part of his skull. His chest and stomach was scarred from the shrapnel of shell fire. He walked with a limp, and was later confined to a wheel chair in his old age. Yes, these people deserve this moment celebrating springtime in Maine. Let this photo remind you that you never know what’s just around the corner. Live life to its fullest. Love one another. Great Grammy and Grampy, I raise my glass to you! 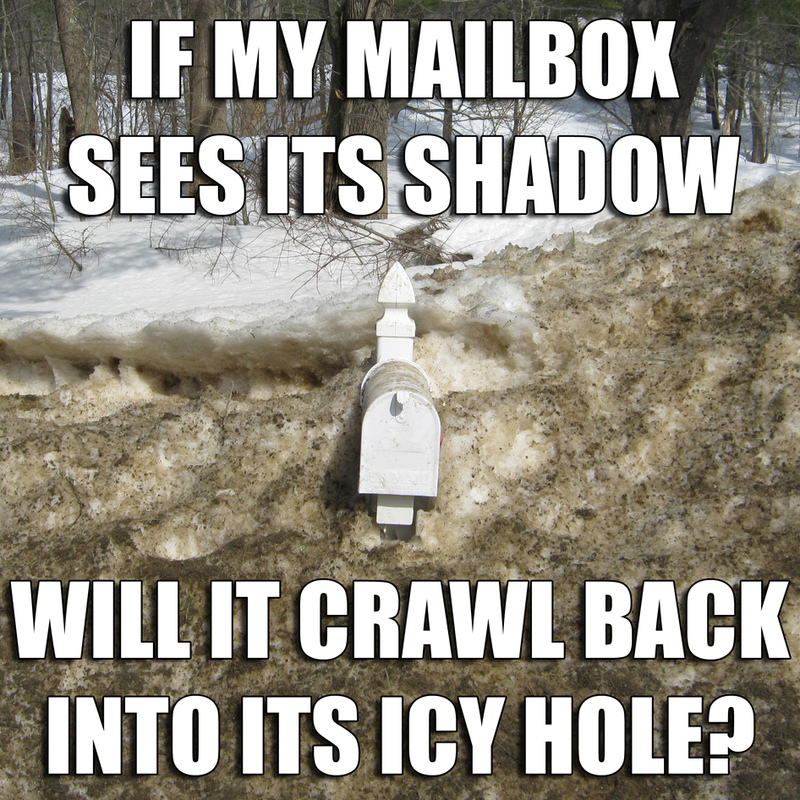 After months of picking up our mail at the local post office, I am glad to report that Winter 2015 is coming to an end. My mailbox peeped out of its icy hole yesterday. Spring is here in Maine! 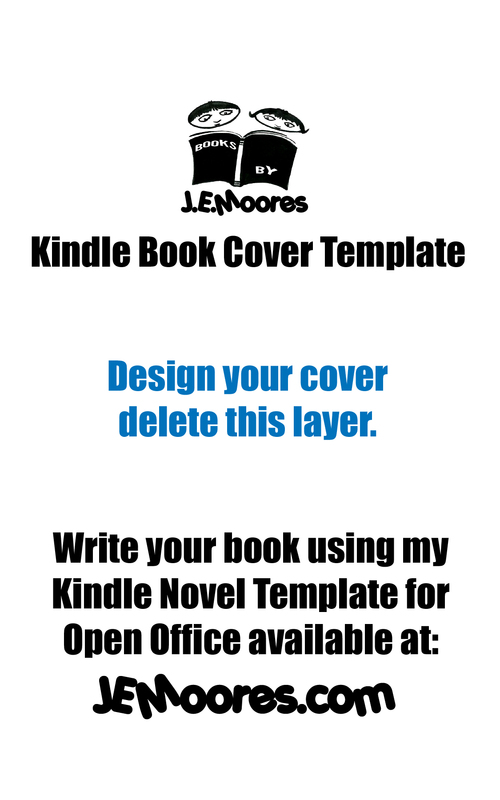 When I wanted to write books for Kindle I found a great Open Office novel template created by Bill Myers. 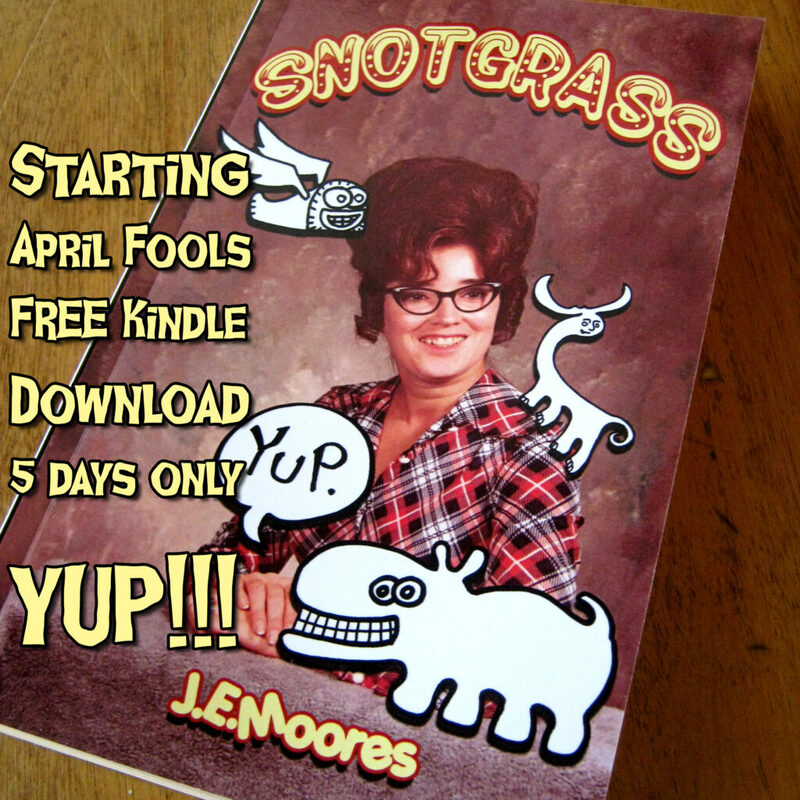 I have since updated Bill’s Kindle template with information I had to figure out on my own. It took me forever to figure out how to remove Mango Bob from Bill’s template so that my book was not titled Mango Bob. I have since stripped all author information from the template and given instruction on how to add yours. Hopefully my updates make it even easier to write and publish your book to Kindle Pub, and when you do, it won’t be titled Mango Bob. One of the strange issues with Open Office is “curly quotes”. The program switches from straight to curly and it makes folk crazy fixing them. I have added a Macro into this template to fix that issue. Instructions for use are on the template. I suggest saving your Open Office book in odt format. Once you are done convert the odt using Alkinea into a mobi. 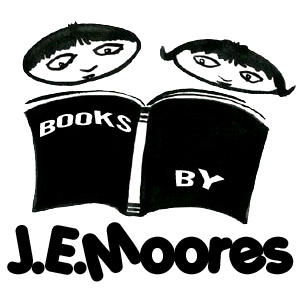 Use Kindle for PC/Mac to look your mobi file over, and if you like what you see, send the mobi file into Kindle Pub. The best part is, Open Office and Alkinea are free programs, so all you have spent is your time. Open Office Writer – read download carefully and opt out of browser tool bars and other software bundled with Open Office. KindleGen and Kindle for PC/Mac – you need KindleGen to power Alkinea, and Kindle to open a mobi file to proof your finished book. Alkinea – Free software that converts Open Office odt files to mobi files. 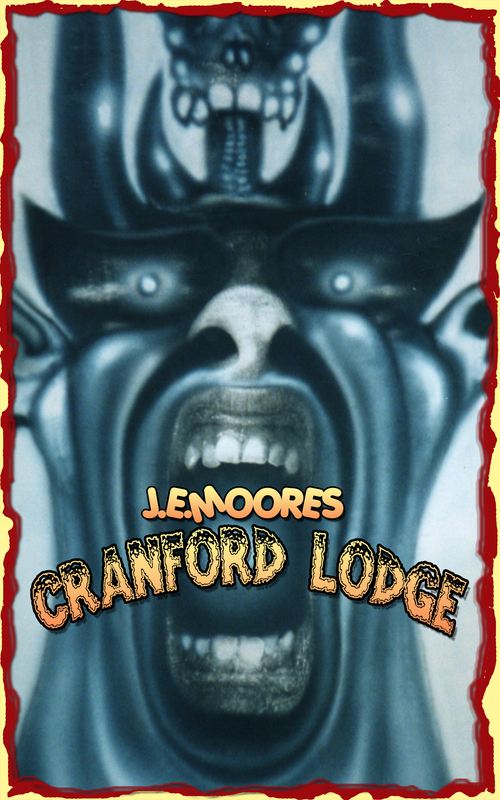 Here is the first choice in book covers for my ghost story Cranford Lodge. The story deals with a tale that was told to me by a dear friend of mine. She had moved into a house and started having assault dreams. The dreams got worse until she found herself waking up on her living room carpet, rug burned and hurting down there (her actual words). When she broke her lease to move out, the landlord admitted the disturbed male tenant before her committed suicide. It remains one of the scariest things anyone has ever told me, and the story is completely true. It’s OK to tell the story in words, but a cover like this is not accepted by Amazon terms of service, so I had to move on. The next cover would simply be the demon’s face. No graphic depiction of spiritual sexual assault, just a screaming angry vision of pure hell on earth. 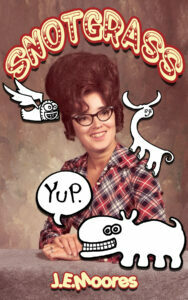 Luckily, this is the cover that was accepted and is found on Amazon. I like it because it is bold and catches the eye. 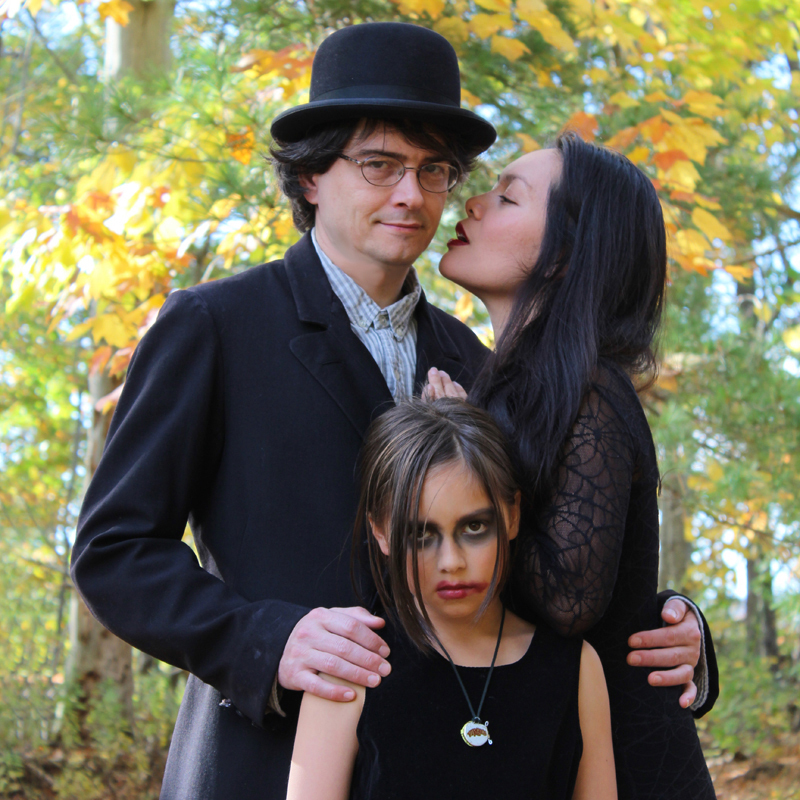 For a customer looking for a spooky ghost story to read, this should get their attention. Sure I still like choice number one, but what can you do? Being an illustrator I find that I enjoy making the cover as much as telling the story. I always make several so I can choose the best, or at least second best. This cover was the most conservative of the three, and therefore my last choice. I do like it for several reasons. One, this is a photo of the actual old 1850 Cranford Lodge farmhouse located in Camden, Maine where the story is set. 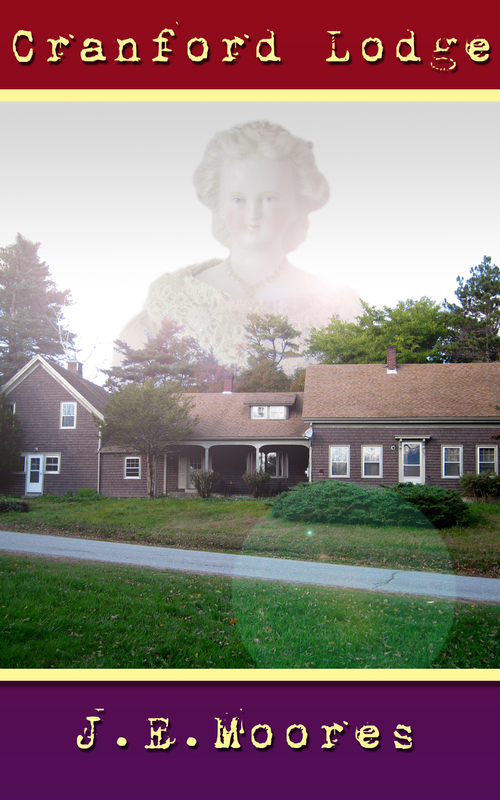 Second, one can almost make out the spirit of Sarah Cranford looming over the house in all her gloom. This cover fits the story well, but I didn’t feel that it grabbed attention quite like number 1 and 2. No matter what anyone says, everyone judges a book by its cover. Which one would you choose? So check out my ghost story set in Maine titled Cranford Lodge available now as a Kindle download on Amazon.